Buying the best term insurance plan in India is a primary requirement of financial planning. Term insurance plan offers protection to you and your family member. It is a basic form of insurance where the sum assured is paid to the nominee on the death of the policyholder. If policyholder survives the policy term nothing is paid. The premium of a term plan is lower compared to traditional policies. However, it depends on age, a term of policy and sum assured. It is extremely difficult to choose best term insurance plan in India nowadays. From LIC to HDFC and SBI to ICICI every company offers a similar type of term plan. You have to be careful in selecting term plan, else you will end up purchasing a wrong policy. 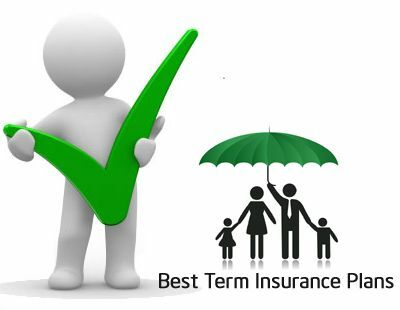 In order to help you here is a list of Best Online Term Insurance Plan in India along with important factors for the selection of best term insurance plan. 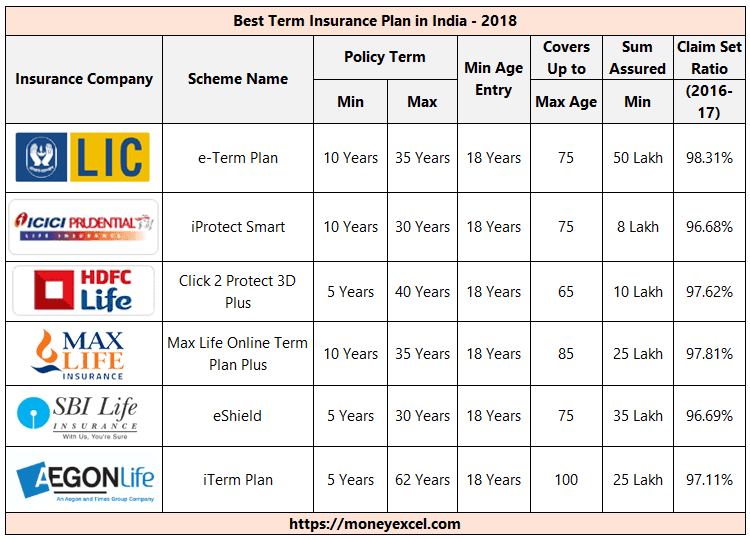 Here are Top 6 Best Term Insurance Plans in India 2019-2020 along with eligibility and key feature list. LIC is most popular and a trusted insurance company in India. One of the best term insurance plans from LIC is e-Term. It is online term insurance plan. The key features and eligibility condition for e-Term insurance plan are given below. This plan can be purchased only via online route. It is pure term plan which means that it only provides death benefits and do not offer any other benefit on maturity. This plan covers all types of death including accidental death. The e-term policy does not offer any riders. Loans cannot be given against this policy. Minimum Policy term is 10 years and a maximum is 35 years. This plan provides coverage up to 75 years of age. Minimum sum assured under this plan for the non-smoking category is 50 Lakh. A trusted brand and high claim settlement ratio of LIC are plus points about this plan. On the other hand, premium amount of this policy is very high and this plan does not offer any riders. ICICI Prudential iProtect Smart is a Term Plan that provides 360-degree coverage to your life at very reasonable cost. This plan also offers claim payment on diagnosis of 34 critical illnesses. The key features and benefit of this plan are given below. You have options to select payout for a nominee from lump sum, Income, and increasing income. This plan offers terminal illness benefit. This means you will be paid for detection of critical illness. It gives you the option to add accidental benefit at the later stage. This plan covers a wide range of critical illness. The death due to suicide is also covered under this plan. Minimum Policy term is 10 years and a maximum is 30 years. Minimum sum assured under this plan is 8 Lakh. Looking at attractive features and benefits, I have rated this plan as one of the best term insurance plans for 2018-2019. HDFC Click 2 Protect 3D Plus Term Plan is unique and best term insurance plans that provide coverage against three uncertainties death, disability and disease. This plan is offered by HDFC. Key features and benefit detail of this plan are given below. HDFC Click 2 Protect 3D Plus offers 9 different options for the coverage. This plan offers life stage protection feature to increase insurance coverage on certain key milestone without medical. It also offers top-up option to increase coverage every year. This plan offers attractive premium rates for female lives and non-tobacco users. This term plan provides comprehensive coverage and premium waiver benefit on diagnosis of critical illness. Minimum Policy term of this plan is 5 years and a maximum is 40 years. Max Life Online Term Insurance Plan is next in the list of best term insurance plans in India. This plan offers basic life cover along with increasing monthly income to your family in your absence. Key features and benefit detail of this plan are given below. Max Life Online Term Plan Plus offers one-time payout to nominee along with increasing monthly income for 10 years. You can maximize plan benefit by opting for additional riders. This plan gives the option to increase coverage at important milestones. The Minimum policy term of this plan is 10 years and a maximum is 35 years. This plan provides maximum coverage up to age 85 Years. This plan is also offered to NRI in the selected countries. High claim settlement ratio, increasing monthly income to nominee and coverage up to maximum age 85 years are plus points for this plan. SBI Life eShield is one of the best term insurance plans offered by SBI Life. eShield is pure term plan. eShield offers a wide range of benefits at an affordable premium. Key features of this plan are given below. SBI eShield offers an option to select a benefit from life cover and an increasing cover. This plan offers inbuilt accelerated terminal illness benefit and two rider options for complete cover. This plan offers a discount on the premium for a non-smoker. The Minimum policy term of this plan is 5 years and a maximum is 30 years. This plan provide a maximum coverage up to age 75 Years. Aegon Religare iTerm Plan is one of the lowest rate best term insurance plans in India. It is the only plan that provides coverage up to 100 years of age. Key features and benefit details of this plan are given below. iTerm plan provides an option to select between lumpsum pay-out or fixed monthly income for 100 months. It offers maximum life coverage up to 100 years. You have an option to increase life coverage during the policy term. This policy provides in-built terminal illness benefit. The minimum sum assured under this plan is 25 Lakh. How to select Best Term Insurance Plans in India 2019-2020? The first point to check is premium. The premium of the plan should be as low as possible. You can get information about premium online on insurer website. You can also do a comparison on the aggregator website. The reputation of the insurance company is another factor while buying a term plan. The insurance company should be capable of managing the fund and fulfilling commitment given on the policy terms and condition. You should avoid new company while buying a term plan. The decision to buy a term plan should follow through an understanding of the product and features offered. You should give additional weight to unique features offered by the company. However, make sure that feature offered by the company is necessary for you or not. Another important factor to consider is claim settlement ratio. Claim settlement ratio means a ratio of claim settled by the company in a year. It is recommended to purchase plan with the company offering higher claim settlement ratio. You can get information about claim settlement ratio from IRDA website. A Comparison of Best Term Insurance Plans discussed above are given below. What are the advantages of online Term Insurance Plans? Nominee of policy will get the lump sum amount in the event sudden death. Term plan provides money so that your family continues to live with pride. Term Insurance also takes care of the family in case of your disability or critical illness. Provides supplementary income in case of loss of income due to accidental disability or illness. Get lumpsum amount if diagnosed with critical illness. Additional sum insured in case of accidental death. Term insurance is basic requirement towards financial planning. If you have not purchased term plan or if you are not adequately covered you should consider purchasing online term plan. Make sure to compare all policies side by side on premium, coverage, additional benefit and claim settlement ratio. This will help you to take an informed decision. If you are facing difficulty in selecting a term plan, you can make use of Best Term Insurance Plans list given above. « Credit Card Limit Enhancement – Should You Opt? which is best among ICICI Prudential iProtect Smart Term Plan and HDFC Click 2 Protect 3D Plus Term Plan?